This forum is for discussing crucian. My club have a small, mostly forgotten about little pond, in which there are loads of tiny crucians. The pond leaked a few years back and all the fish were taken out so I assume these crucians have only recently been stocked. I was fishing there last year for the first time and caught these small crucians one after another on white maggot and thought that this place will be magic when the fish get bigger. SK's latest journal entry reminded me of this place and I am now wondering what the growing rate of crucians is again. Anyone know anything about how fast this species grow? Like many small species crucians can be prone to stunting. They could reach 4lbs in 15 years or stay at 2oz all their lives. I had info on a clay pit with roach in it many years ago and 15 year old roach went less than an ounce. When a natural catastrophe occurred and the 99% of the old fish died we had roach in the same water getting to a pound in 6 years - same strain of fish but a lot more food to go around. It was the young fish that put on a growth spurt. The only way you will know if your crucians are going to grow is to measure them carefully this year and redo the same in a year's time. If no change then they're stunted; if they're 2oz this year, 6oz next year then the potential is there. I too have a little sleeper on a club ticket I must get back to? Stocked some 3-4 years ago and they all but disappeared. I bet they have not all gone!? I'll have to go back again this year and see if I think the average size has gone up at all. 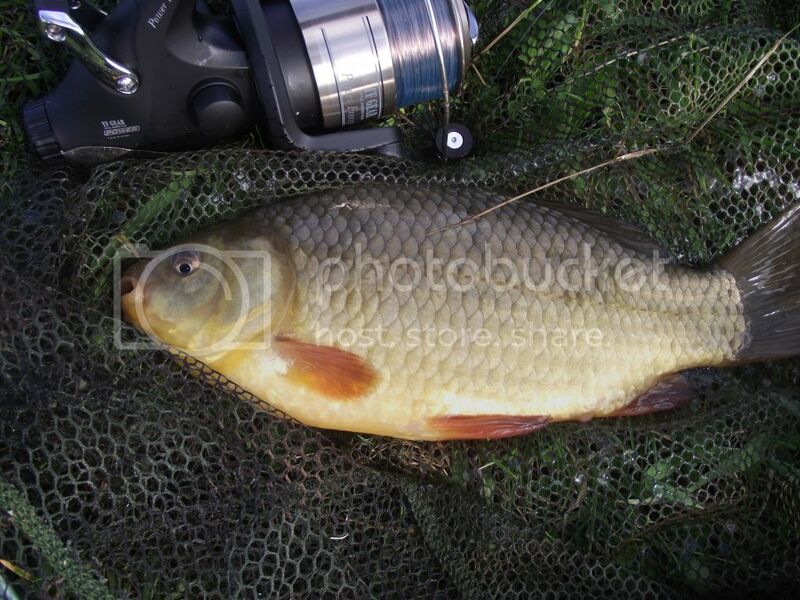 My local pool was stocked 5 years ago with 3-4 inch crucian, here's one I caught last year. Great catch, Jerry and Kingfisher. They're stunning fish. That one is a bit worrying as it looks like a crucian x carp; the head shape is wrong for a crucian but the pic is too out of focus to check scales. This happened on a lake near Bournemouth where true crucians were stocked (not sure if many left as it is fishing incredibly badly at the moment) that bred with the carp to give loads of F1s.